The third instalment of our long distance walk around the SWCP has begun with us again at Hartland Quay Hotel, we again had room 7 one of the rooms with a bay and window seats looking out over the Sea. The breakfast was of course a Full English, we had ordered a packed lunch which we had also done when we stayed last year. The journey today is noted as strenuous and therefore the trip was marked as 8 miles to Morwenstow, we didn’t want to head all the way to Bude roughly 15 miles because of the strenuous nature and we like stopping and enjoying the views and beaches we come across. The forecast for today was basically wet. And although the day started overcast with the possibility of rain in the air, we didn’t have to put our hoods up as the rain came in from the sea at Welcombe Mouth, well to be accurate just before we reached Welcombe Mouth. After this point the sun broke through and we had a pretty good day, the only thing that did cause us some issues on route was the wind, which was truly bracing. Heading out from Hartland Quay and reaching Speke’s Mill Mouth, we checked out the waterfall, which not 2 weeks previously myself and the girls had been swimming under. From here it was a pretty easy run to Welcombe Mouth, but from this point forward the climbs got tougher and these were the reasoning for the stretch is strenuous. We took lunch on the beach at Marsland Mouth, which is right on the Devon and Cornwall border. As we crossed into Cornwall I pointed out to Anne that we would now be spending several years in Cornwall, meaning it would take several holidays before we rounded to the South coast and back into Devon. The climbs and descents continued and at Henna Cliff the second highest sheer cliff drop in England at 450ft (137mtr), we took a rest at Hawker’s Hut, and then from here finally wandered to the Bush Inn at Morwenstow, in the evening we took a short walk to look round St Morwenna and St John the Baptist Church. 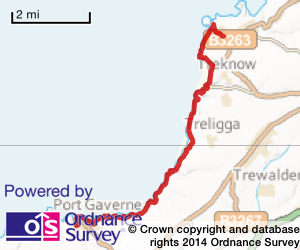 12.04 miles Distance, including extra walks to beaches and to the ends of any points we visited. Total time out including stops photo opportunity, enjoying tea and cake, 5 hours 45 mins. Total this week 5 hours 45 mins. Total walk time out 73 hours 47 mins. An extra piece of info from my Fitbit total Steps = 27,441 including extra walks to beaches and to the ends of any points we visited.